Picture yourself sitting at a tucked-away sidewalk cafe in Paris, with some guy named Francois adding to the ambience with some classical accordion music. The smell of fresh-baked baguettes harmonize in the air with spring lilacs, truffle oil and rich onion soup. 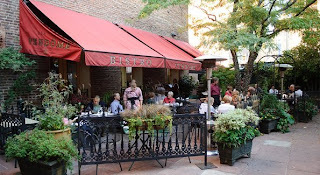 Call that a traditional French dining experience, and I'll say that Bistro Vendome's patio is the next best thing. And you don't need to know your french to dine there. Granted, you will need it to read part of the menu. Lucky you, the descriptions are translated. On a hidden corner in Larimer Square, Jennifer Jasinski's acquired concept brings french romance and charm to one of the best locations in LoDo. You'll feel like you're worlds removed from this state you call home as you dine here for a Saturday or Sunday brunch. When you walk through the classically adorned french doors, you find yourself in a quaintly romantic spot. Seating is scarce (especially when the patio is closed) so make your reservations ahead of time for this experience. Once you're in, however, this concept is ridiculously complete. Everything from the menu boards printed on mirrors on the far side of the dining room, to the darkly wooded dining sets, fresh baguettes, rich french onion soup with the perfect gruyere finish, fine lace curtains, and of course the patio. It's all french to me. As if the atmosphere wasn't enough, the food hits the spot as well. Vendome has one of those menus where you wish you could order one of everything. Focusing on brunch this time around, they feature one of the best bloody marys in town (granted smaller than the usual, but don't miss this one) accompanied by a number of other traditional morning cocktails. Properly dubbed Gueles de Bois, or 'hangover drinks' eluding to last night's events, you can take your choice of biere rouge (red beer) or a collegiate favorite, the screw driver. We're not talking minute maid and smirnoff here though. The food speaks for itself, once again bringing you back to the streets of Paris. With a lot of smaller plate options, you can mix and match to your pleasure, share a few appetizers, and top it off with a proper finish. On our gorgeous saturday, we opt for the onion soup to start. With a rich, savory beef and onion base and a tinge of sweetness, this well rounded delicacy is an ace from start to finish. They even manage to keep the baguette chewy and crispy, and that, my friends, requires finesse. Next up: Salade Campagnarde. Not to be confused with canard, there's no duckling in this one. I made that mistake with my shoddy french. Granted, I was pleasantly surprised and not disappointed. Perfectly al dente redskin slices adorned with mushroom duxelle border a bed of dijon-tossed greens, drizzled with truffle oil. Gastronome meets homestyle with a sunny-sided egg, completing the dish and creating an impromptu sauce. Do yourself a solid: order a dish with fries and another side of them. Trust me, you will be fighting for the crumbs here. Move over nine75, there's a new kid in town. And he just beat up your honor student. 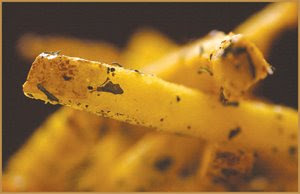 Made with Kennebec Potatoes and coated in a sweet champagne gastrique with herbs de provence, these pommes are finger-licking. You really can't go wrong with your main dish choice. But for days ending in 'Y', tackle out a Gaufre Maison for dessert. This light, fluffy waffle kisses your palate with Nutella whipped cream that will make you think you're in a dream sequence. Topped with Sauterne poached pears, dark chocolate and candied walnuts; texture meets smooth succulence. You may even reconsider sharing this and keep it all to yourself. Gluttony you say? You'll understand. 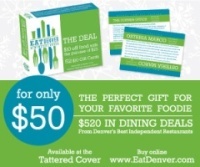 The Denver Dish is an open forum. 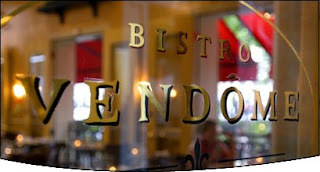 Please feel free to let me know how your experience at Bistro Vendome was. I'm looking forward to hearing your comments on the blog in general as well. I understand your sincere devotion for this place, so I will give it another try. Perhaps when the patio is open and the snow isn't melting from my head to plate, like my first encounter with this "fine diner". I do, however, find it interesting that such, as you describe, finger-licking fries can be compared to those of Good Times - if you had picked a place more deserving of that title, I might be tempted to get them.